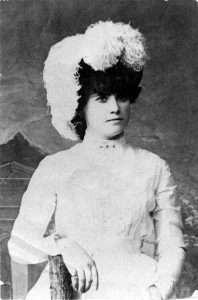 There were many Irish women among the settlers of the American West, and one of the best known in her time was a lady from County Cork named Ellen Cashman. Ellen came to America, like so many others, fleeing the effects of the Great Hunger. She arrived in Boston in 1850 with her mother, Fanny, at the tender age of five where she grew up caring for a younger sister. An ambitious young lady, she worked as a bellhop in a well-known Boston hotel when she decided to follow the call of the American West with the idea of making her fortune. She moved to San Francisco and soon found employment as a cook at various mining camps. By 1872, she’d saved enough money to open a miner’s boarding house in Nevada. In this male-dominated arena, she relied on her courage, faith and a formidable pride in her Irish roots to survive. It wasn’t long before she was headed for a gold-strike in British Columbia along with 200 Nevada miners. 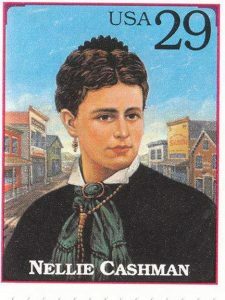 Described as Pretty as a Victorian cameo and, when necessary, tougher than two-penny nails, the extraordinary Nellie Cashman wandered frontier mining camps of the 1800s seeking gold, silver and a way to help others. A devout Catholic, she set up a boarding house for miners, asking for donations to the Sisters of St. Anne in British Columbia in return for the services available at her boarding house. On a trip to Victoria to deliver $500.00 to the nuns, she heard of 26 miners trapped by a snowstorm in the Cassiar mountains who were suffering from scurvy. Nellie immediately organized an expedition with six men and collected food and medicines and set off to rescue them. Conditions in the Mountains were so dangerous at the time that the Canadian Army considered it a foolish venture and sent troops to bring her back. They found her on the ice of the Stikine River, cooking her evening meal. She offered the troopers some tea and convinced them that she would not head back without rescuing the men. After 77 days of trekking through stormy weather, she and her team, pulling 150,000 pounds of food often through 10 feet of snow, found the sick men, but instead of the 26 reported, there were 75. She nursed them all back to health with a vitamin C diet and endeared herself to the entire mining community earning the first of her many titles, Angel of the Cassiar. However, when the gold strike petered out, she bid farewell and headed south for the big silver strike in Tucson, Arizona. Nellie arrived in Tucson on October 10, 1878. It was a growing town where Nellie hoped to prosper and she bought, worked and sold mining claims, boarding houses, restaurants and mercantile shops, each one adding to her climb up the ladder to financial security. In June 1879, just after opening Delmonico’s restaurant and advertising ‘the best meals in town,’ a silver strike in Tombstone turned her head. Here was a town growing faster than Tucson. Retaining ownership in the Delmonico, Nellie headed for Tombstone. There, she opened a shoe store, then a general store and, a year, later she was back in the food business with Tombstone’s Russ House Restaurant. Among her customers were her fellow Irish-American citizens like the McLowery gang, the Clantons, and the Earps. Local legend notes that a client once complained about Nellie’s cooking and Doc Holiday, sitting nearby, drew his pistol and asked the man what he’d said. Looking down the barrel of Doc’s gun, the man said, Best food I ever et. Nellie decided that since Tombstone was known as the most lawless town in the west, it needed a dose of religion. She befriended John Clum, editor of the Tombstone Epitaph and he helped her champion the construction of a Catholic Church and Hospital. In the meantime, she persuaded the owners of the Crystal Palace Saloon to allow Mass to be held there every Sunday. During the week, she walked the dusty streets of Tombstone soliciting donations from gamblers, miners, prostitutes, badmen, lawmen and average citizens. She added her own sizeable contribution and on November 28, 1880, a Catholic Mass was first held at the new Sacred Heart Church; construction of a hospital soon followed. Nellie’s organizing ability wasn’t limited to Church and Hospital either. Noting that almost 600 of Tombstone’s residents were native Irish, Nellie organized that town’s first St. Patrick’s Day celebration. It was a grand Ball held on March 17, 1881. Nellie is remembered today by historians as the Angel of Tombstone, Angel of the Cassair, and Saint of the Sourdoughs, but her contributions were far from over. Having brought civility to ‘The town too mean to die,’ Nellie moved on to Bisbee, Arizona where she leased the Bisbee Hotel and prospected a while. She followed the lure of precious metal to towns in Wyoming, Montana, and New Mexico. Wherever she went, her fame preceded her, and everywhere she went she provided financial assistance to Catholic Churches and hospitals. In 1898, she pulled up stakes again and headed back to British Columbia, Alaska, and the Yukon. St. Joseph’s hospital in Victoria, British Columbia; St Mary’s hospital in Dawson, Alaska and St Matthews’s hospital in Fairbanks, Alaska, all owe their existence in part to Nellie Cashman’s fundraising activities. Beside her philanthropic fame, she was an astute businesswoman and a fair miner. There are even stories of her competing in an arctic dog-sled race while in her late sixties. Her last stop was Victoria, British Columbia, where, on January 25, 1925, she died of pneumonia. She lies in a plot with the Sisters of St Ann, overlooking Ross Bay. When asked by a reporter why she never married she said: Why child, I haven’t had time. Men are a nuisance anyhow, now aren’t they? They’re just boys grown up. Today, the Sacred Heart Church, built in 1880, still stands at the corner of Fifth and Safford Streets in Tombstone Arizona and the Nellie Cashman Restaurant stands nearby behind the adobe walls of her original Russ House. A remarkable woman, she is just one more of the many links between Ireland and the American west of which we are so proud. On March 15, 2006, Nellie Cashman was inducted into the Alaska Mining Hall of Fame.